You don’t want your day to be over after your last run, right? No? Good! This is where we find out… What’s Your Après Adventure? Looking for a DJ and drink specials? Live music and great views? How about rustic elegance and wine? Or maybe something for the kids? Whether you’re a family, a couple, or a group of friends, there are plenty of experiences to take advantage of after your day of skiing and riding on the mountain! Here’s a quick guide to help you discover which après places and events are best for you here at Keystone. A51 After Hours Après – DJ’s, drink specials, and legendary ski and snowboard videos! If that sounds like an après you’d be interested in, head to the Last Lift Bar in the Mountain House on Thursday from 2 until 5pm for the A51 After Hours Après! Colorado Spirit’s Tasting – Spirits. That just sounds fun, doesn’t it? Sample from four different, weekly rotating Colorado spirits at the Keystone Ranch on Thursdays at 4pm. Parents Night Out – Hey parents! Need a sitter? Keystone Ranch has your back! Every other Thursday night you get the opportunity to relax and enjoy the experience of top rated cuisine at Keystone Ranch while childcare professionals provide your children with a safe and fun evening with their own menu, crafts, movies, and more. Ripperoo Ice Cream Social (Kid’s Après) – Kid’s need some chill après time, too! Theirs is super cool because it includes Ripperoo! On Wednesday and Saturday kids can hang out with Keystone’s favorite pup at the Ripperoo Ice Cream Social! Head to the Mountain House at 3:30 for ice cream and to have a chance to create your own Ripperoo t-shirt to remember all the fun you’ve had at Keystone! The cost is just $5.00. Après Ski Yoga – Sometimes you want a little more relaxation for your après experience. If that’s the case, Keystone Spa and Fitness is your place for yoga classes at 4:30pm every day. 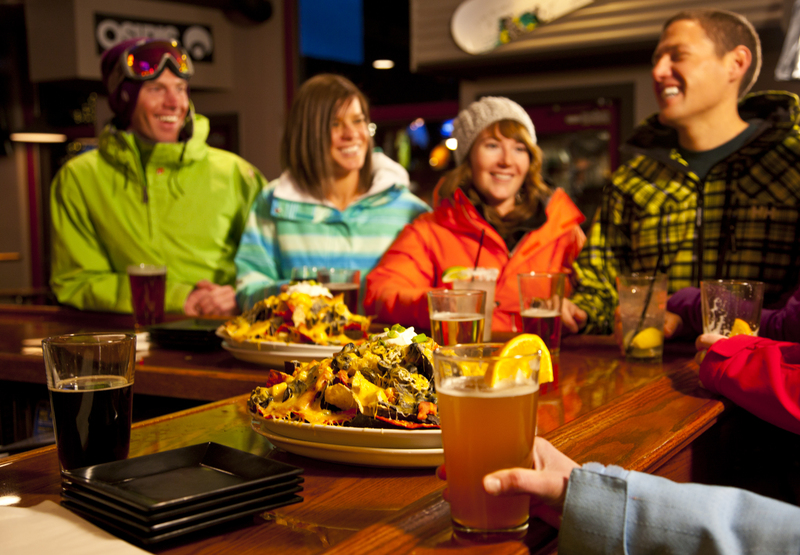 9280’ Tap House – This is the place to be for après on a fantastic deck! Happy Hour from 3-6pm. $4 Draft of the Day, $4 Jager Shots, $4 Fireball Shots. Chill in the great Colorado weather with the excellent views in River Run. Bighorn Bistro & Bar – Daily Happy Hour from 3-6pm with $3 Drafts, $4 Wells, $5 House Wines and $6 App’s. There’s live music Thurs – Sat and breathtaking views of Keystone Lake & The Continental Divide every day! Last Lift Bar – When you go upstairs at the Mountain House you’re going to find a great après ski experience every afternoon and evening. There is live music on the weekends, incredible food, and excellent company waiting for you! Ski Tip Lodge – Enjoy après ski daily from 3-5pm with a special Après Menu that includes Korean Style Beef Short Ribs, Bruschetta Du Jour, and Char-Grilled Portobello Mushroom. Oh… we can’t forget to mention 25% off all wines by the glass! Keystone Ranch – Experience Happy Hour in the rustic elegance of this original 1930’s ranch homestead every Tuesday – Saturday at 4:30-5:30pm that includes half price wines by the glass and half price beers!